Another week filled with Download N Go fun! 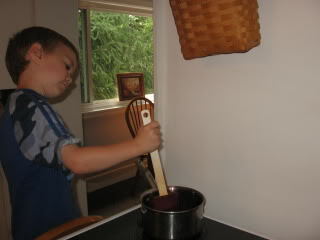 After Chocolate Challenge, Elijah decided that we'll do all the food studies (so we'll eventually get to Hoppin' Popcorn and Crunchy Cookies too! 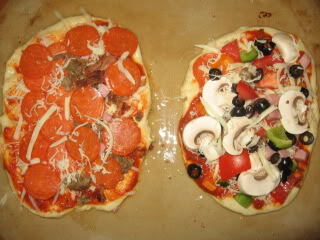 ), and this week it was time for a Pizza Party! Don't be deceived by the name of this study. 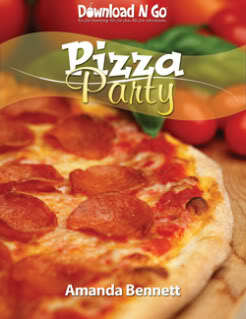 Pizza Party is about SO much more than pizza! We learned a ton about Italy. 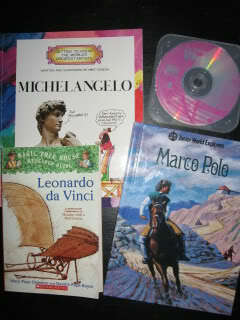 We also were introduced to five famous Italians: Marco Polo, Vivaldi, Leonardo da Vinci, Michaelangelo, and Galileo. 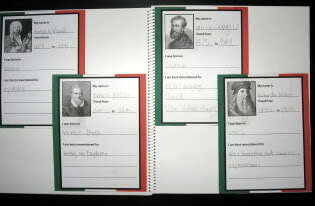 I have a feeling that Elijah might be turning his focus & energy to learning about Galileo over the next few weeks. He was very curious about this Italian astronomer. 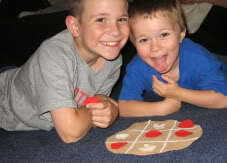 I made an easy tic-tac-toe board for the boys (the link was in the study). So cute and it added a little extra fun for them. 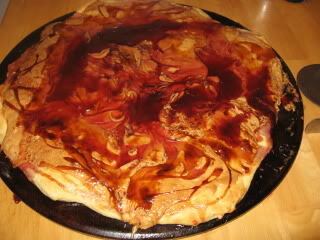 On Tuesday we had a peanut butter and jelly pizza for lunch (Elijah's request). 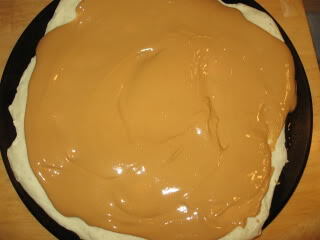 If you attempt this, make sure you make the crusts high on the sides. Put the toppings on AFTER you bake it. 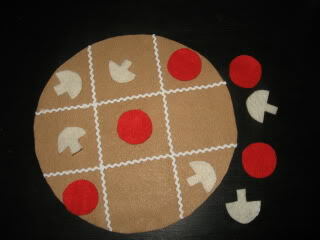 The boys LOVE this pizza 'cause it's like a warm PB&J sandwich made with super fresh bread. YUM– even if it is ugly and messy! 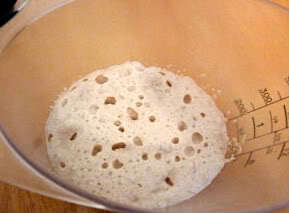 On Day 4 we did a Yeast Experiment. 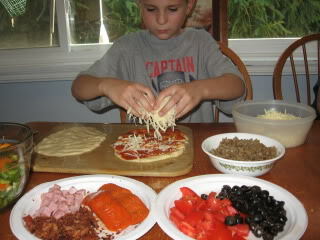 We also made personal pizzas for dinner on Thursday. 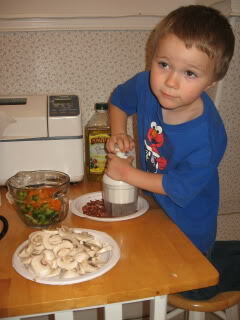 Simon helped out by chopping up the bacon. 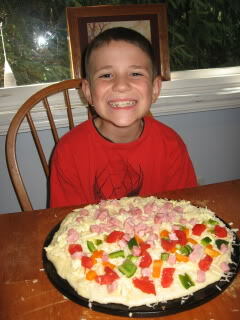 Elijah got to sample some of the new toppings he wanted to try (bacon, sausage, and ham). 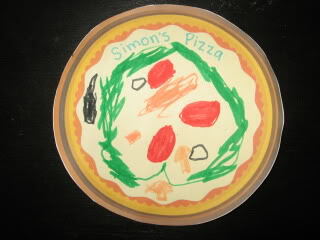 Simon put EVERY topping on his pizza! 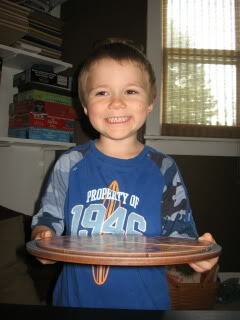 And, of course, by the final day of our study, Elijah had a notebook to put together. 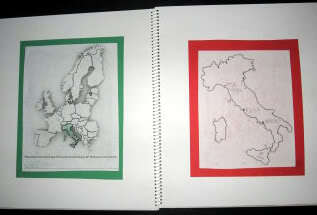 We use spiral bound Bare Books. 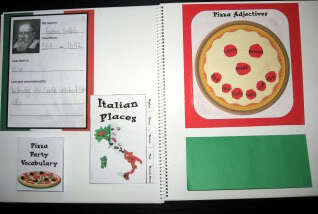 Simon didn't make a lapbook this time, but I printed an extra copy of the "Pizza Adjectives" pizza and cut it out so Simon could decorate his own paper pizza. That is one HUGE ring of green pepper! 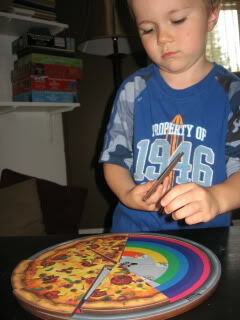 He also had fun helping cook and with our Tuzzles Pizza Fraction Puzzle. I think we've found our groove with Download N Go! We won't be doing these studies all the time, but they are nice to use when the topic fits Elijah's current interest. They are also great for sparking NEW interests! We hope to use Crazy Cartoons, Davy Crockett, Rockin' Robots, Kite Capers, Crunchy Cookies, Magnificent Moon, and Hoppin' Popcorn sometime this year. 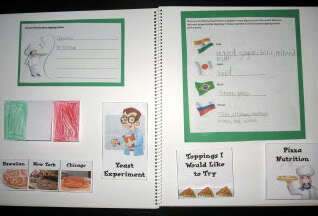 It took me one hour to plan our week (from start to finish) including printing pages, deciding on recipes & making a shopping list (pizza ingredients, felt for pizza tic-tac-toe), pulling books off my shelves, etc. It doesn't have to take this long, but I looked through the extra links in the study. I don't print every page (that would be 112 pages!). What you see in Elijah's notebook is everything I printed (about 25 pages this time). 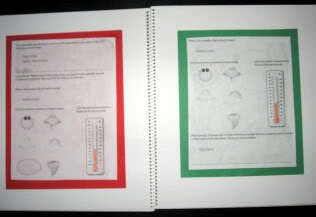 We do most of the worksheet pages orally (Elijah narrates answers to me) instead of printing them. You can read more about how I get ready for DNG in my Sunny Seashells post. Now the next one with Simon, that’s more like it! I was serious. He told me he wanted to try some new smiles. 😉 He looks like he’s in pain. I think he is. Imagine Elijah . . . panicking about trying scrambled eggs and ham on a pizza. Looks like fun! I think we might try and line a few up with FIAR books this year to use when we are looking for rabbit trails. Okay- now THIS is a DNG I could go for! 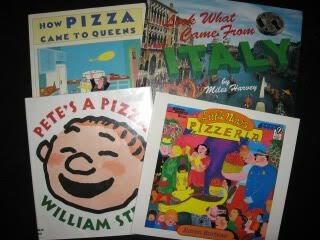 We just might have to get this one- we love pizza (and this is the closest I’ll probably ever get to “visiting” Italy). Pete’s A Pizza is a hoot! 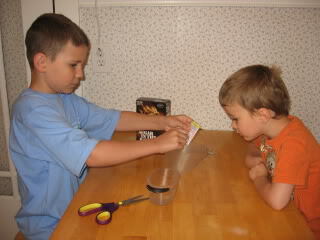 We have the Scholastic video and we reenact it here quite often lol. Ami, I can’t wait to get started on this one. It looks like a lot of fun. 🙂 I love that giant pepper slice! mmmmm. food is my favorite thing to study too! this is such a cute unit study! 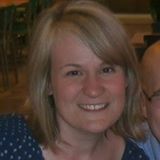 I’m currently homeschooling 2 children and we lapbook, minit book, and notebook constantly and love it! 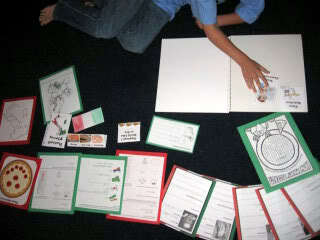 We use Homeschoolshare, Amanda Bennet, and ones I’ve put together myself w/blank templates. Loving it so far, and the kids are too. WHERE are the best deals on printer ink, and HOW do the rest of you afford this expense?! I’m going through ink like crazy, but I don’t want to skimp on the lapbooking because it’s SO effective as a teaching tool. Any advice? Thanks! Oh, not sure if this is a proper place to ask a question like this, and if there is a better place just tell me! My friend found a local office that will print for .10/page which is pretty reasonable. Try calling around (local university with a print shop?) and see what you can find. Also, I have a color toner printer that someone gave me, but I haven’t purchased cartridges for it yet. The start-up cost is HIGH, but the prints come out at a great deal (much cheaper than ink).